Like many of you who follow our blog, our identity is not defined soley by our love of RVing. We have other interests that add to our identity. One of our numerous interests is bicycling, and to further that descriptive, multi-day self guided bicycle touring. We have been planning for a number of months to do a two day tour with a college days friend starting at the AMTRAK station near Angel Stadium in Anaheim, CA (yes, near Disneyland, also) and finishing at the AMTRAK station in downtown San Diego. 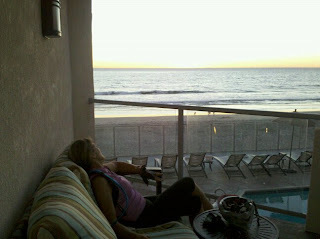 Terri, our good friend from our college days, was scheduled to arrive at our home in Ontario, CA November 11th, and she did. She lives in Northern Nevada, so it was about a 9 hour drive for her. Our plan was to drive down to the AMTRAK station located in the parking lot across from Angel Stadium (baseball Angels) in Anaheim. 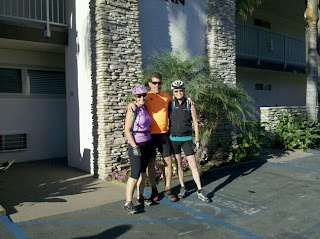 We left home around 8am, and arrived in Anaheim around 8:45am, starting our ride around 9:45am. 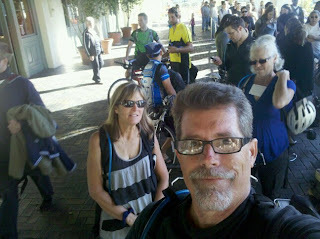 As always there were a few mechanical issues with the bikes that had to be resolved....one was a flat tire on Elaine's bike....inexplicable since the tires and tubes were brand new....oh well, so much for plans to depart the train station at 9am. 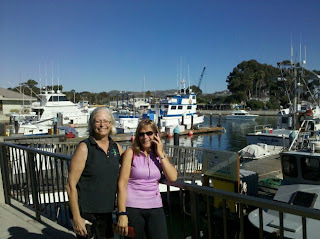 We proceeded over to the Santa Ana River Trail that runs parallel to the Santa Ana River all the way to Newport Beach, CA about 14 miles south. The bike path is completely separate from local roads, and highways. 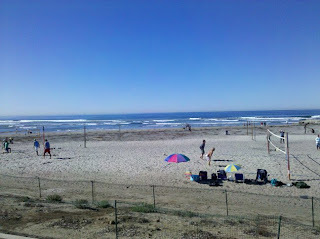 We hit PCH (Pacific Coast Highway) around 11am, and proceeded south through Newport Beach, Corona Del Mar, Laguna Beach, Dana Point, San Clemente, Camp Pendleton (Marine base), and Oceanside to our destination for the evening, Carlsbad, CA. The distance for that first day was 68 miles, and we made it just before sundown at 4:40pm! 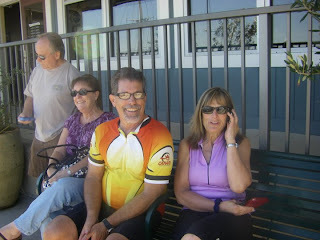 We ate lunch in Dana Point at Proud Mary's located in the Dana Point Warf area where we joined some friends who have cycled with us in the past, Ted and Eileen. Ted and Eileen (below) to my "right", Terri to my "left"
We had a nice evening in Carlsbad, CA staying overnight at the Best Western Beach Terrace Inn, and dinning out at a local Italian Eatery (Fresco's) located on Carlsbad Village Drive just below Carlsbad Road. We departed the next morning around 8am heading south on PCH to our final destination for the day, San Diego....40 miles away. The day was spectacular.....sunny, cool, and no clouds. 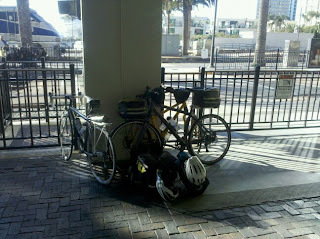 We passed through Leucadia, Del Mar, Solana Beach, La Jolla, and finally arrived at the downtown San Diego AMTRAK station around 2pm. Before arriving at the station we stopped at an In-N-Out burger place in Northern San Diego for lunch! 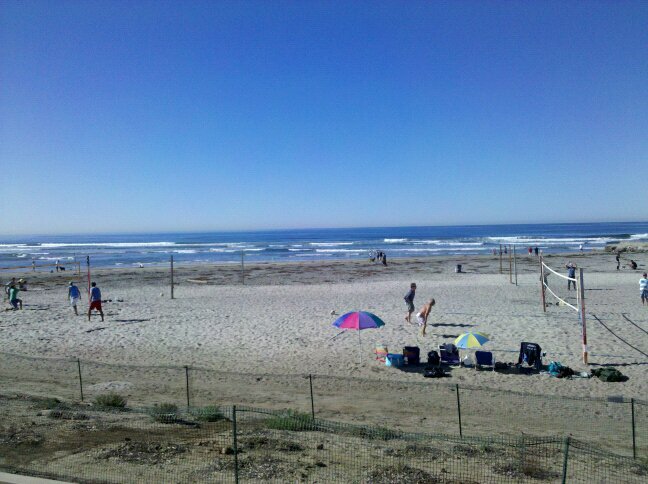 Our return ride would be on the Surfrider and it was scheduled for departure at 3pm. We chose the Surfrider as they have bicycle racks on each car that can handle up to 3 bikes....exactly the number we had! Their cars look a lot like the Metrolink commuter trains. There was a delay of about 45 minutes as the train arrived late from Los Angeles. We arrived just after sundown in Anaheim.